"A very elegant-looking salad which is sure to impress your guests." Pour balsamic vinegar into a small saucepan, and add the crushed garlic; bring to a boil over medium-high heat. Reduce heat to medium-low, and simmer until the vinegar has reduced to 1/4 cup. Set aside, and cool to room temperature. Divide the lettuce leaves among 4 salad plates. 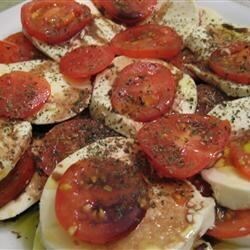 Arrange the tomato slices on top of the lettuce, then place the mozzarella on top of the tomatoes. Sprinkle the salads with the red onion, raspberries, and sliced black olives. Season with dried basil, salt, and pepper; drizzle with the olive oil and balsamic vinegar. I typically do not like tomatoes, but this salad was excellent. I added the olive oil, basil, salt and pepper to the balsamic reduction once it was cooled. Great and simple. Use a good vinegar, it compresses the complex flavors and you'll appreciate the difference. I used calamatta olives instead of black to give it an occasional kick as well. This recipe for the balsamic reduction is GREAT!!!! I didn't make the tomato mozzarella salad, but I used it over a greens and salmon. A TOTAL hit!! !